YoYoExpert Blog & Yo-Yo News – New 1A Yo-Yo from Japan Tech – ORIGIN! New 1A Yo-Yo from Japan Tech – ORIGIN! Japan Technology took all of the POM design knowledge and experience they have gained from making some of the best offstring yo-yos not he market and applied it to one masterful 1A throw – The Origin! The Origin has a feel unlike anything we have thrown. This lightweight machined plastic yo-yo has a fast featherweight feel on the string that is just a joy to throw. It plays zippy yet comfortable and maneuvers through combos like it’s reading your mind! Japan Tech crafted the weight distribution so perfectly that the Origin has a powerful spin and holds stability through complex tricks, which is a rare feat for a sub 63g plastic yo-yo! We can’t figure out how they did it, but we are impressed. The Origin is a serious performer that you’ll want to throw for hours on end! Japan Tech worked closely with Bryan to create a new yo-yo that would really fit his style of play. They designed the AIRE after the Japan Tech model Bryan favored most – The Kamui. You’ll notice some similar characteristics of past JT models, but in play the AIRE is unlike any other! 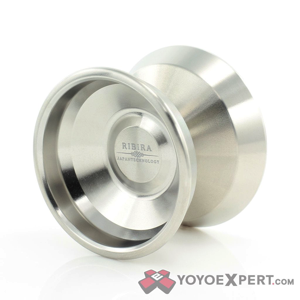 The Ribira is not just a yo-yo made from titanium, it is a yo-yo design that would not even be possible without titanium. Japan Technology didn’t cut any corners; they spent almost 2 years researching different types of titanium, discovering new manufacturing methods, and constructing multiple prototypes until they finally reached perfection.